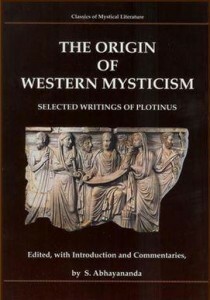 The Origin of Western Mysticism – selected writings of Plotinus – is compiled, edited and commented by by Swami Abhayananda. He has graciously allowed us to offer them here as well.The Origin of Western Mysticism is an attempt to systematic present Plotinus’ thoughts, with selections from his own writings on distinctly separate elements of his metaphysics, in order to facilitate an understanding of his integrated vision. It seems that, in the title and in the body of the article on “The Origin of Western Mysticism”, you have misspelled ‘Plotinus’ as ‘Plotonius’. Would you please correct your copy to reflect the actual title. Thank you.